I’m very nearly up to date with posting work now. I’ve had an incredibly unproductive few months, so unless I really pull my socks up, the sparsity of my blogging will only get worse. Partly I have just been lazy, but mostly I have allowed myself to be completely diverted by some non-art related projects. One of those diversions has been the arrival of a new puppy. She’s just turned 6 months old now and is settling in perfectly. It’s been quite a shock to the system having a ball of energy around after such a long time with, and then sadly without, our beloved old ladies, but she has brought so much fun and happiness we’re really enjoying every moment of getting to know each other. I know it’s considered normal for people to juggle full-time jobs, children, pets, elderly relatives and more, so I feel pretty lame to admit just how much things have slowed down with the arrival of a dog. First of all, I am very fortunate to be able to work from home and even more fortunate to have a very supportive husband to take the financial pressure off things. 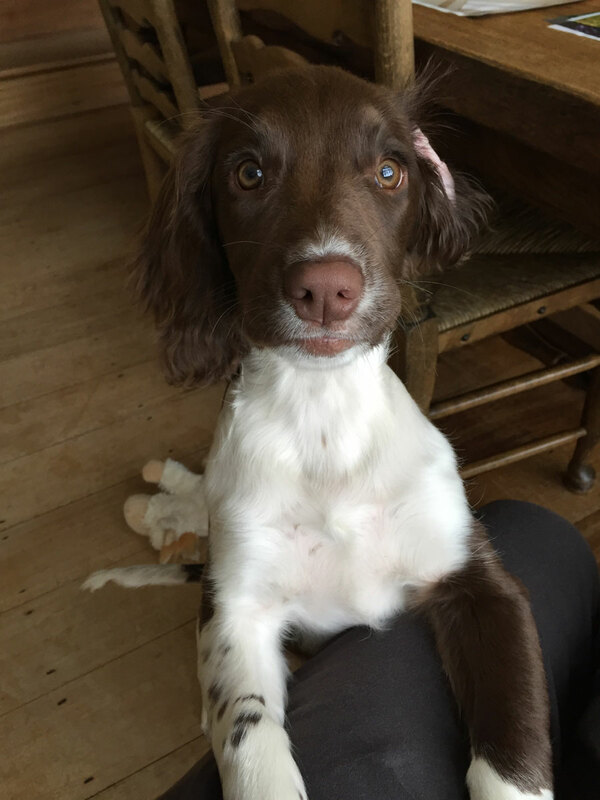 This has allowed me the opportunity to take time out to be with the puppy and put in the effort to (hopefully) lay the foundations for a confident, relaxed adult that’s a pleasure to be with. In short, I wanted to do everything I could to give her a good start – ultimately making all of our lives easier in the long term. I finally felt better about the slow down in work when I met a fellow painter and springer spaniel owner at the Royal Institute of Oil Painters’ Annual Exhibition last week. I’ve followed and admired this painter’s work for years and it was great to finally meet in person. We spent a great deal of our time discussing our dogs, and when he confided that he too had found it practically impossible to keep up his regular output during the first TWO YEARS I was so relieved to know it wasn’t just me! Anyway, back to the true subject of this post. 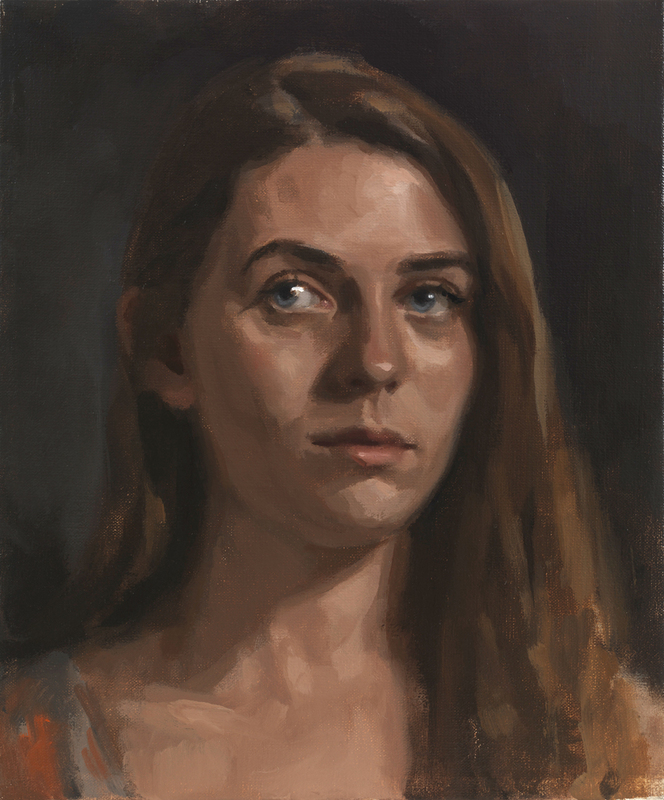 The final pre-Nelly project of the year, this portrait was painted during the Midsummer heatwave, and to say that the studio was like an oven would be an understatement. I tried not to overdo the shine on Francesca’s skin, but as you can imagine, we were all melting, and avoiding all sense of ‘glow’ was impossible. This was only a short project of 3 or 4 afternoon sittings – one of which following an all-nighter at Stonehenge for the Solstice. I like this portrait. I unconsciously laid the paint down a little differently than usual – although I find I can’t articulate how exactly. Maybe it was the heat, or the canvas, or I used more medium than usual to get the brush flowing? I’m not sure. Mostly I just think of the time of painting and remember a really pleasurable week of heat and light and something very English in the landscape and atmosphere. Just a few months on, this painting inspires a feeling of nostalgia, indeed I think it inspired that strange bittersweet emotion even at the time.